Xtreme Gymnastics provides classes for athletes 18 years and younger. Our different gymnastics programs give our students a chance to develop their personal character through athletic achievement in a positive and fun environment. 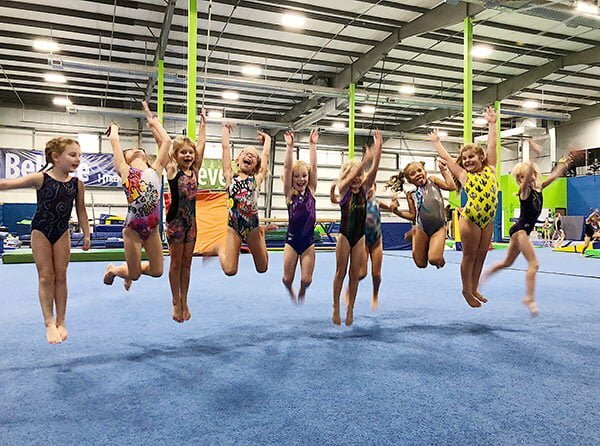 We are committed to continuous improvement and want to make sure that each of our gymnastics students learns a healthy balance of fun and skill. Schedule your free trial class today! Learn more about our different classes to find the right fit for your student! We have toddler gymnastics classes for children 5 years and younger. Our fun and exciting gymnastics training will change from month to month to challenge your little athlete and keep them engaged and eager to learn something new week after week! Our instructors are trained and ready to make sure your child is learning safely in a fun, positive, developmentally-appropriate environment. Our instructional gymnastics classes are a fun and positive way for girls age 6 and older to develop their gymnastics skills. We offer five gymnastics levels to ensure that our athletes are in the appropriate class that will challenge and encourage continual growth! Our trampoline classes are a well-rounded, athletic training experience that is beginner-friendly. Trampoline is designed for children 6 years and older, with the goal to gain control over their body movement and tumbling ability. Our coed trampoline class will increase your child’s fitness, strength, and flexibility. Xtreme offers 3 different tumbling levels for tumblers! Beginners looking to perfect their handstands to advanced athletes who want to develop back tucks, back handsprings, and fulls. Our tumbling is a great enhancement to competitive dancers and cheerleaders repertoire. Our instructional classes are designed to be engaging for gymnastics athletes of every age and skill level. Schedule your free trial class today!